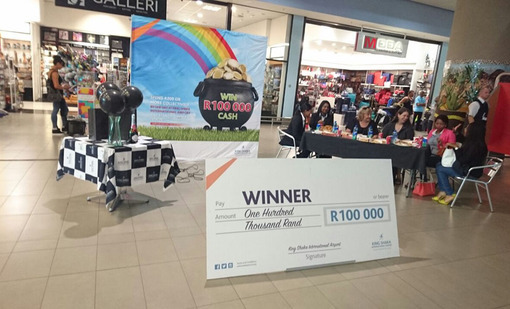 King Shaka International Airport were proud to host the Win R100 000 Cash draw today. 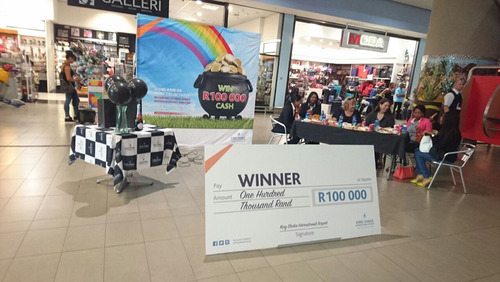 Tension was in the air as the three finalists geared up to participate in the live draw and it was definitely on their minds that one of the lucky three ladies were about to win a whopping R100 000 in cash!!! The competition was simple to enter. 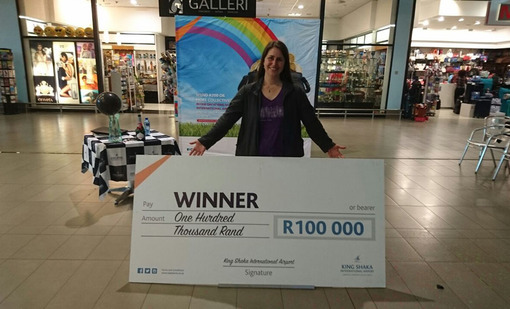 Simply spend R200 or more at any of the stores at King Shaka International Airport in one day, fill out an entry form, and stand a chance to win R100 000 in cash!! 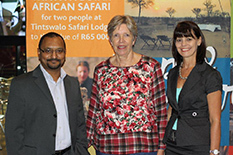 The three finalists were Thabiso Makgoka, Brigitte Gerhardi, and Jermaine Appalsamy. The three ladies and their guests were treated to lunch prior to the draw. They all excitedly discussed around the table how they would spend the money. The formalities began and they then had to pick a number out of a bag to determine the order of popping the balloons. 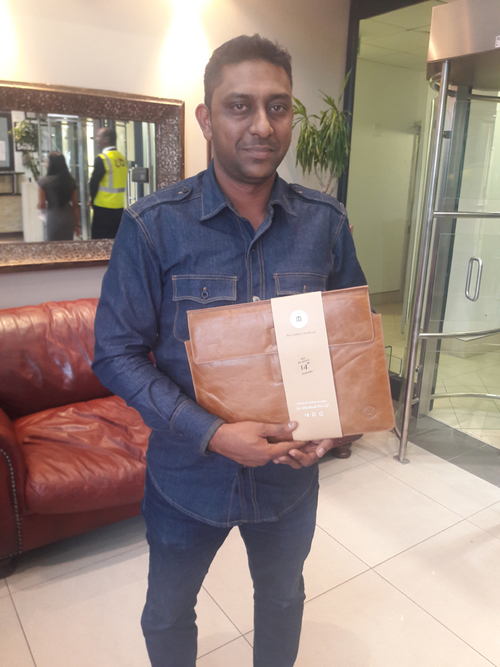 Three black balloons were filled with confetti – one of the 3 balloons had green confetti – this was our lucky winner balloon – if you popped the green balloon you will be the owner of the R100 000 cash. Jermaine was first in line and the tension mounted as she popped her balloon and to great disappointment, she did not win. 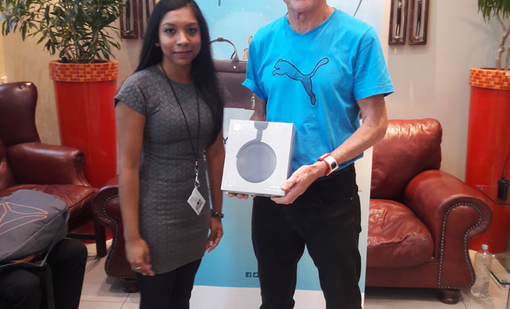 Jermaine didn’t leave empty handed though, she got herself a little gift bag from King Shaka International Airport. The next contestant was Brigitte who said she felt nervous and had almost a sick feeling as it got closer to her turn. She approached the stand with balloons and discussed with her God- Mother Eileen which balloon she should pick. Brigitte was so nervous she kept her eyes closed while popping the balloon and only realized she won when everyone was screaming. Her eyes filled with tears of excitement as she began to process what had happened. Brigitte was in Durban on holiday with her Husband, son and in laws and upon leaving, she decided to have lunch at Spur so that her son could play at their play area. 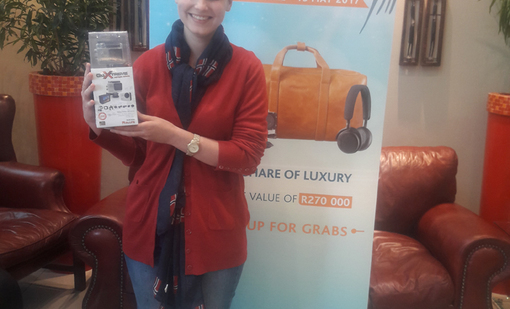 Upon entering Spur, Brigitte noticed the competition box and decided she had to enter…and, luckily for her, that’s exactly what she did. 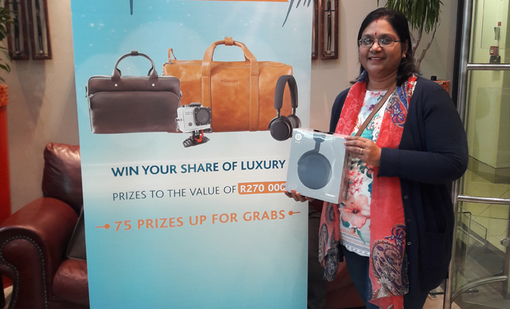 “Really really thank you, I am super impressed and this was just really awesome” were Brigittes words to Airports Company South Africa and King Shaka International Airport. Brigitte is planning on buying a new car or spending on a little holiday – or both. 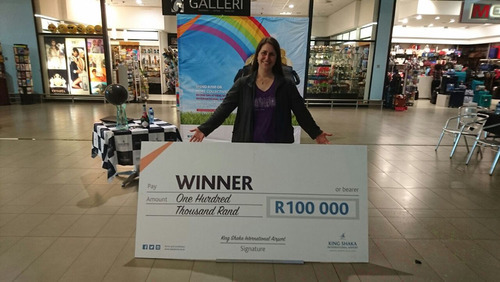 We Congratulate her and hope that she enjoys her R100 000 Cash. 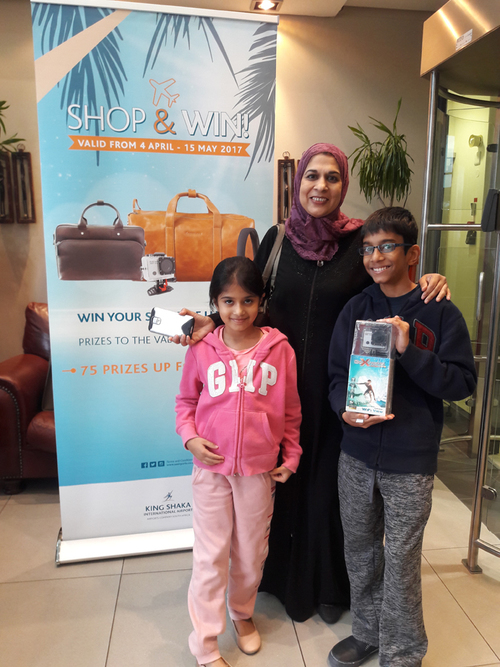 CONGRATULATIONS TO ELIZABETH FERREIRA THE WINNER OF THE SHOP & WIN A CAR COMPETITION! 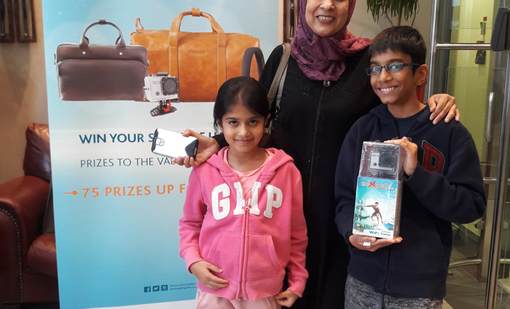 KING SHAKA INTERNATIONAL AIRPORT, Durban, 26 April 2016 | Culminating in a live draw and peaking the curiosity and delight of local shoppers and travellers alike, three hopeful and very excited finalists, together with an enthusiastic crowd of family, friends and curious shoppers and travellers, gathered at King Shaka International Airport on Tuesday 26 April 2016 for the grand finale of just one of the airport's all-inclusive and fun campaigns, the Shop & Win a Car competition! 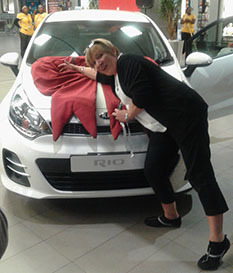 The competition, which would see a very lucky shopper drive away in a brand new KIA Rio valued at R247 000, took place at King Shaka International Airport from 16 January 2016 until 31 March 2016. By simply spending R200 or more, collectively, in one day at any of the various stores at King Shaka International. 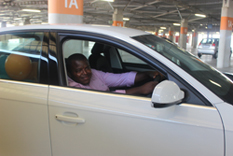 Elizabeth, who was flown in all the way from Port Elizabeth, very precariously and with much uncertainty, sat in what could be her new car if her key would start the engine. With shaky hands she put the key in its place ... the lights burst into action and the car's engine purred to a roaring start, much to the delight of the crowds around the car! 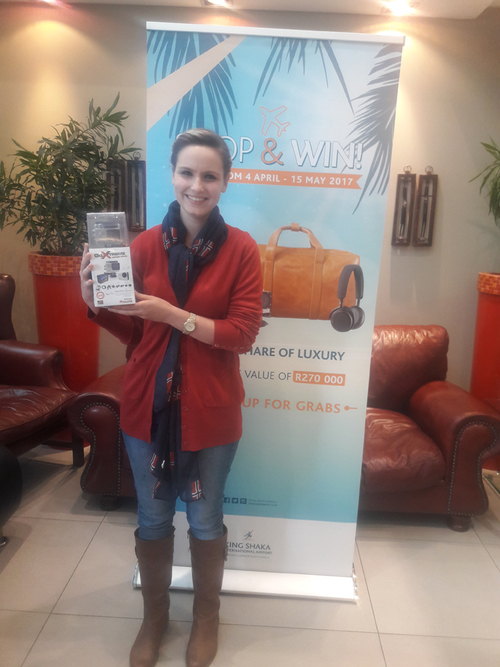 Paula is the winner of the dream trip for two people at the luxury 5 star, Tintswalo Safari Lodge, to the value of R65 000. The prize, includes a 5-night stay for two at Tintswalo Safari Lodge, including an exciting helicopter ride for the adventurous and two game drives to explore the ultimate luxury safari experience with sights and sounds abound on the Big Five game viewing. 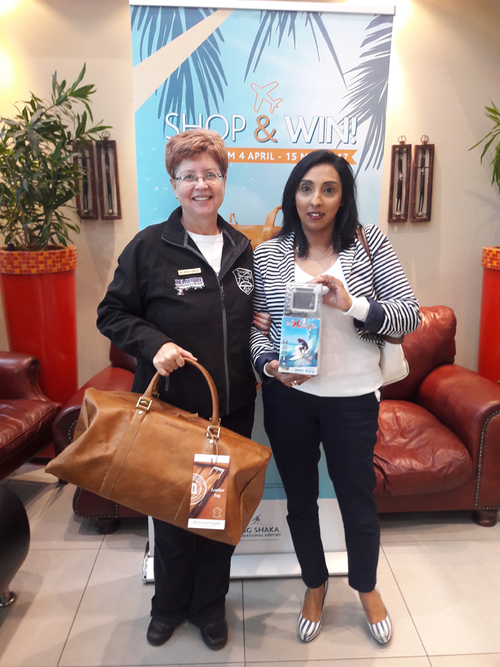 The Shop & Safari @ King Shaka International Airport competition was open to all travellers to the airport, provided they spent R350 or more in one day at any store. The competition was run by Airports Company South Africa and the officially appointed advertising agency Kwenda Marketing. For more information contact the Kwenda Marketing team on0119216408. Visit Facebook www.facebook.com/ClickBuyFly or follow @ClickBuyFly on Twitter for upcoming competitions, promotions and events. 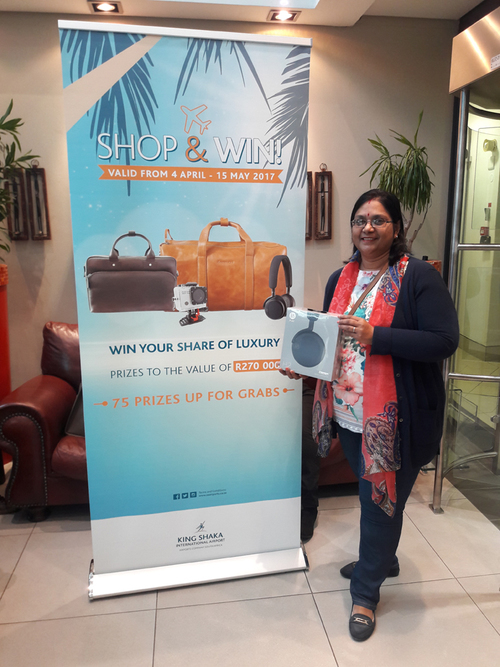 When local businessman, Shane Williamson, purchased a festive gift at King Shaka International Airport, and subsequently entered the Win a Dream Holiday on a whim, he never once imagined that he would be the winner of a magical trip to the Maldives. 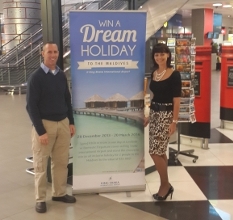 The Win a Dream Holiday @ King Shaka International Airport competition was open to all travellers to the airport, provided they spent R100 or more in one day at any store. The trip includes a 7-day all inclusive trip to the Maldives for two people and is valued at R65,000. The winners will enjoy a stay at Olhuveli Beach & Spa 4 Star resort, which isset in the azure heart of the Indian Ocean that is the Maldives and known as one of the best luxury water villa accommodations available on this magnificent island. The competition was run by Airports Company South Africa and the officially appointed advertising agency Kwenda Marketing. For more information contact the Kwenda Marketing team on 0119216408. Visit Facebook www.facebook.com/ClickBuyFly or follow @ClickBuyFly on Twitter for upcoming competitions, promotions and events. 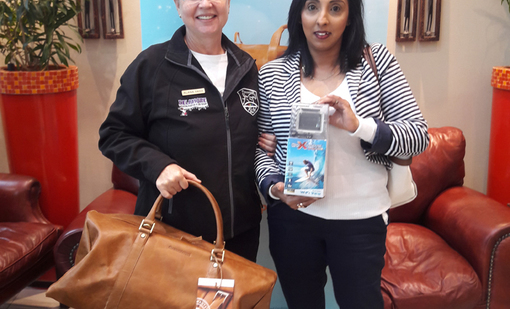 CONGRATULATIONS TO KIM ALLAN ON WINNING A 5 DAY CRUISE ON THE MSC OPERA! 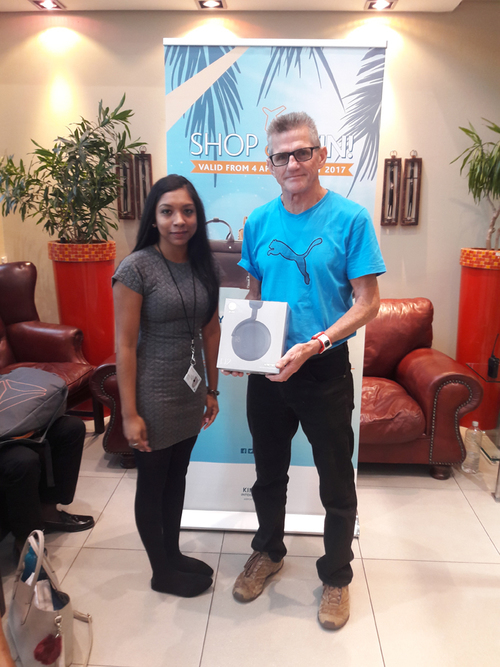 King Shaka International Airport is proud to announce, the winner of Shop & Sail @ King Shaka International Airport, Kim Allan. King Shaka International Airport is proud to announce, the winner of ACSA 20th Anniversary birthday celebration competition. 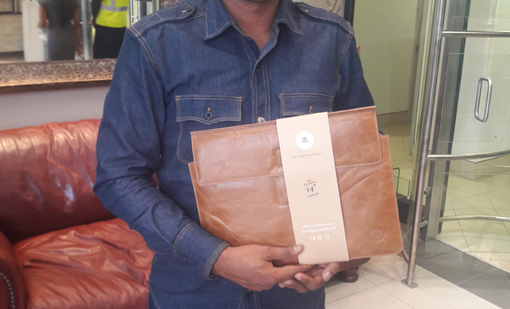 Lungani Masibuko said that he was proud to be the winner and often supports the retail facilities when he flies in and out of King Shaka International Airport. His winning till slip was from Galleri where he bought a gift for his girlfriend, consisting of perfume and a key ring, for her return trip. He said, the retail mix at King Shaka International Airport is great and has a little of everything, for everyone at reasonable prices.